Our focus in the design phase of each project is taking the clients ideas and priorities and integrating them with our own. We offer two types of design services, the first of which is a traditional two dimensional drawing of the project. We typically use this type of design for projects that have large quantities of plant material as it is easier to call out specific plant varieties. The second design service we offer is an interactive cad design. This program is exceptional for allowing a client to do a virtual walkthrough of their future poolscape. As a client takes their virual tour they can hear the sound of their water features from every angle of their landscape, they can also swim down into the pool and see the pool finish in the water as well as looking out the windows of the residence to see their poolscape from different rooms. Give us a call today and we can come up with a design taylored to your specific project. When it comes to remodels we can transform an old pool into something exceptional. From a simple re tile to re plastering all the way to changing the shape of the existing pool and adding a tanning shelf, spa or a variety of water features. Bring us your ideas and we can make them a reality. We build almost every type of pool imaginable including negative edge pools, freeform pools, lagoon style pools, beach entry pools, pools with tanning shelves and umbrella sleeves, rectangular pools with covers, swim up bars, and a variety of natural and synthetic stone water features, laminars, and sheer descents. 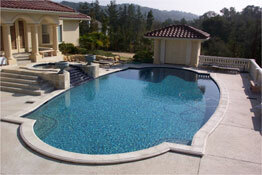 We do a variety of pool finshes including all tile, pebble tec, pebble sheen, pebble fina and plaster. We also offer a variety of tile choices including glass tile, ceramic tile, and natural stone depending on the style of pool. We At Barefoot Pools we are committed to preserving our natural resources. 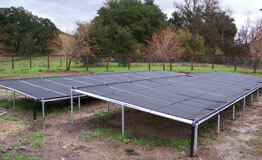 We use the most energy efficient building techniques and equipment sets available. Wind plays the largest factor in heat loss, so we design our landscapes with natural wind screens on the prevailing wind side of the pool. We also use automatic safety covers in many of our projects. These help to keep chemical usage at a minimum by blocking uv rays, as well as offering an insulating barrier from the wind. We use variable speed pumps and led lighting in a majority of our pools which reduce energy consumption by up to seventy percent. We suggest solar systems in many applications as they reduce or eliminate the need for heating in the pool season, adding as many as four months to the typical swim season. 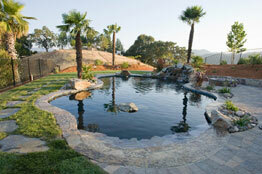 We specialize in building lagoons and ponds. We build all types of ponds including habitats designed to creat a mini eco system including fish and aquatic plant life, to lagoon style ponds that are intended to look natural but have the technology and filtration to make a safe swimming hole. We can incorporate flowing and creeks water falls to enhance the feature. 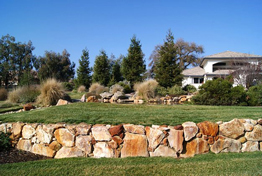 Often times wil build rock walls that are incorporated into the pond accented with planted pockets creating a layered water feature with interest. Dreaming of a poolscape that promotes your healthy lifestyle? It is a widely accepted fact in the fitness industry that swimming promotes cardiovascular fitness and endurance, while burning calories and increasing strength. 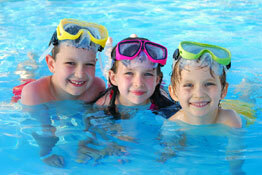 Swimmng also increases flexibility and bone density. We can create a pool taylor made to your specific fitness needs. How about a pool with fun features such as a beach entry and tanning shelf that incorporates a swim lane to one side creating a fun lap pool? 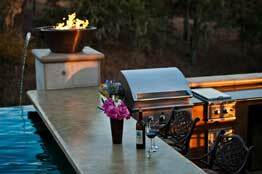 We install numerous types of outdoor kitchens and barbeque areas. Most of our kitchens are custom designed and built for your individual space. We use many different counter materials including granite slabs, natural stone tiles, and ceramic tile, depending on the style of home. 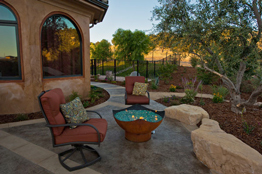 We also build custom pizza ovens and outdoor fireplaces. We try and use accent materials on these features that tie them into the landscape. 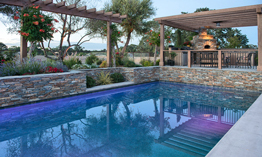 Two elements that we love to incorporate into the poolscape are fire and water. We offer several different varieations of this, all of which are a dramatic addition to any pool or landscape. 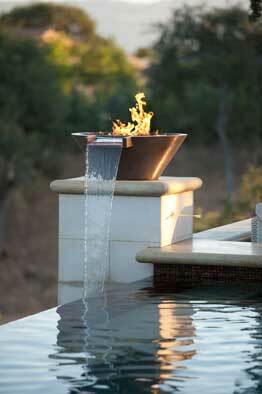 Picture the elegant look of water cascading out of a decorative fire bowl into your pool at the touch of a button! The finishing touch! 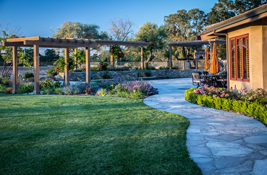 A well designed landscape pulls the entire yard together. Integrating the landscape design with the pool build is extremely important from a design standpoint as well as from a practical build standpoint. With a properly designed and integrated project neither element will look out of place and both the pool and landscape will flow together creating a refined outdoor living space. 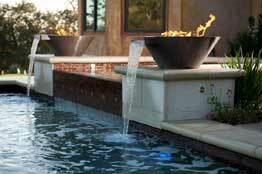 The addition of decorative water features in the landscape further pulls the pool and landscape together. With the addition of a properly designed low voltage lighting system the landscape will come alive at night. We offer themed landscapes including traditional japanese gardens, whymsical english gardens, formal italian gardens, elegant contemporary landscapes as well as rustic country landscapes. We have the plant knowledge and know how to make any of these work in your specific area of the central coast. In any poolscape privacy is always priority. All of our poolscapes can become back yard retreats with the right plant material and fencing. If fencing needs to be used to create privacy we love to soften the look of the fence with large plant material or scented vines to give the outdoor room a lush feel. We build many types of walls including dry stack adelaide stone, granite walls, masonry ledger stone walls, all different types of block walls, pour in place masonary walls and cmu block walls. Depending on the style and needs of your project we can build a wall suited to your specific requirements. 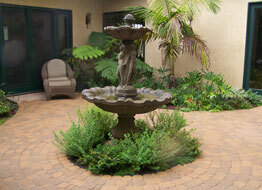 We offer a variety of options for driveways, pool decks, walkways, and paths. 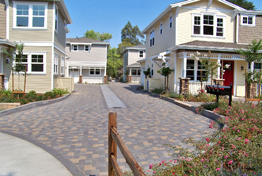 We install concrete pavers, flagstone, stamped concrete, colored concrete, and stained concrete. We try and use a surface that accents the residences unique features as well as a practical application that works for your specific needs. Do you have a courtyard that you aren't sure what to do with. Let us design something unique for your residence. How about a paver pattern with that incorporates a unique shape and design with a focal water feature in the center?